A History of the Alumnae Association of Hartford Hospital's School of Nursing, 1892-Present. When going through the many books of minutes, I elected to leave out all the usual business that took place at every meeting, i.e. minutes, committee reports, etc. I only picked out the interesting/important decision re: AAHHSN. The meetings were held in the Residence or Heublein Hall usually. Format was minutes, business, speaker/food/entertainment provided by different classes. This is written in a documentary style with dates and people involved in the Alumnae and the Professional organizations. I also included the decisions regarding our involvement with the School and Hartford Hospital. Martha Wilkinson, class of 1890, wrote a fine history from 1892 through the early 1900's and it follows here with a few insertions from the minutes. 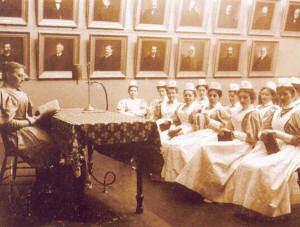 Linda A. Richards, Lady Superintendent of the Hartford Hospital Training School for Nurses from 1895 to 1897, instructs a class of student nurses. "Early in 1892, fourteen classes had completed the two years' course in instruction and and ninety-nine nurses received the diploma of the Hartford Hospital Training School for Nurses. On March 24th of that year, Miss Hannah L. Russell, class of '83 invited the graduates of the school still located in Hartford to meet and have tea in her apartment in the Waverly Building. Consternation reigned among patients and physicians; what would happen next?? Nurses in general and Miss Russell in particular spending valuable time attending a Tea. As a result of this Tea Party, it was decided to hold a reunion to which all graduates of the school would be invited. Graduates living in the city each contributed five dollars to cover the expenses of the reception. A committee was appointed and officers elected. Mrs. Mary Dennison, '82 Chairman; Miss M. E. Hicks, '82 Secretary; Mrs. Henrietta Willette Childs, '89 Treasurer. A dinner and reception was held in the Allyn House on June 1st at 7:00 p.m. Mrs. Frances A. Tuttle, first superintendent of the Training School presided and 60 graduates coming from all parts of the country were present. Mr. Leander Hall, superintendent of the hospital and Mrs. Hall and all members of the hospital house staff who had served since the organization of the Training School were invited to attend. This gathering was so successful that a permanent organization was formed and named the Hartford Hospital Training School Alumnae Association. Mrs. Tuttle was elected President; Mrs. M. E. Brown '85 Vice President; Miss M. E. Hicks '86 Recording Secretary; Mrs. Henrietta Willette Childs '89 Treasurer. Constitution and By-laws were accepted and plans made to hold meetings quarterly and a reunion annually. Thirty-five nurses responded to the first roll call. The reports of the early meetings of the Association show that little business was transacted, yet one of the nursing problems of that day (as of the present day) was the "question of Nurses Charges and Hours of Work". The public accepted the fact that nurses were going to attend meetings as well as Tea Parties. We find in 1893 the graduates deciding to make an increase in their charge, eighteen dollars per week for ordinary cases and twenty-five for Scarlet Fever and Diphtheria. At a later meeting the same year, we find a decision to return to the former fifteen dollar per week charge because of business depression and unemployment. 3/6/1884 -- Miss Plummer announced that she felt sure no objection would be made by the surgeons to graduates attending operations at Hartford Hospital. She advised them, if convenient, to wear wash dresses or at least to bring an apron. Linda A. Richards, America's first trained nurse, became superintendent of Hartford Hospital's Training School for Nurses, later called the Hartford Hospital School of Nursing. During the early years of the Alumnae Association, it received loyal support from the Hospital Superintendent, Mr. Hall, and from the superintendents of the Training School. Miss Periss Plummer took an active part in all the work of the Association, giving time to write papers, preside at meetings and in the absence of other members, acting as chairman of the Entertainment and Arrangement Committees. Miss Linda Richards and Miss Elizabeth Friend took an active part in the work of the Alumnae Association. It was through the efforts of Miss Friend in 1900, that the Alumnae Association united with the Associate Alumnae (now the American Nurses Association). The Associate Alumnae was organized in 1896. Our Association became a member in 1900, and Miss M. E. Hicks was elected to attend the Annual meeting as our delegate. 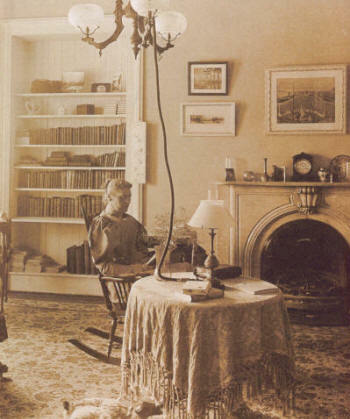 When the Nurses Residence on Jefferson Street was completed, it was decided that the Alumnae Association should contribute something for the comfort and entertainment of the pupil nurses. Mrs. Mary Dennison Fuller 1882, and a committee of members raised sufficient funds to purchase a piano, which Miss Friend received for the Residence and gave a cordial invitation to hold all it's future meetings in the Nurses Residence. For a number of years, $5.00 was contributed annually for the purchase of magazines or books for the library. In March, 1901, the question of having a room at the hospital where nurses could be cared for was discussed and a committee appointed to look into this. In December, 1902, a committee was appointed to interview the Executive Committee of Hartford Hospital regarding terms under which they would give us a bed 52 weeks a year. In June 1903, Dr. Morgan reports that the Executive committee could not let the Association have a bed for less than $15,000. The next important event was the celebration of the 35th Anniversary of the organization of the Training School. A banquet and reunion was held at the Hotel Garde on Mary 9, 1912. Miss Hannah Russell '83 presided. Miss Alice H. McCormac '05, Chairman of the Committee of Arrangements ran the affair and Miss Martha Wilkinson '90 was Toast Mistress. The following toasts were responded to: The Hospital, by Miss Lauder Sutherland; The Training School by Miss Ida Butler '01; First Graduation, Mrs. Carrie House '79; The State Board, Miss R. Inde Albaugh; The Private Nurse, Miss Ada Dalton '93; Our Graduates, Miss Alice McCormac, Absent Members, Miss Esther Johnson ;08. One hundred and thirty nurses attended this reunion from all parts of the United States and Canada, and many letters and telegrams were received from those unable to attend. Mrs. F. A. Tuttle was the guest of honor. The success of this reunion was largely due to the faithful and efficient work of Miss Russell, President of the Alumnae Association and Miss Alice McCormac, Chair of the Committee of Arrangements. 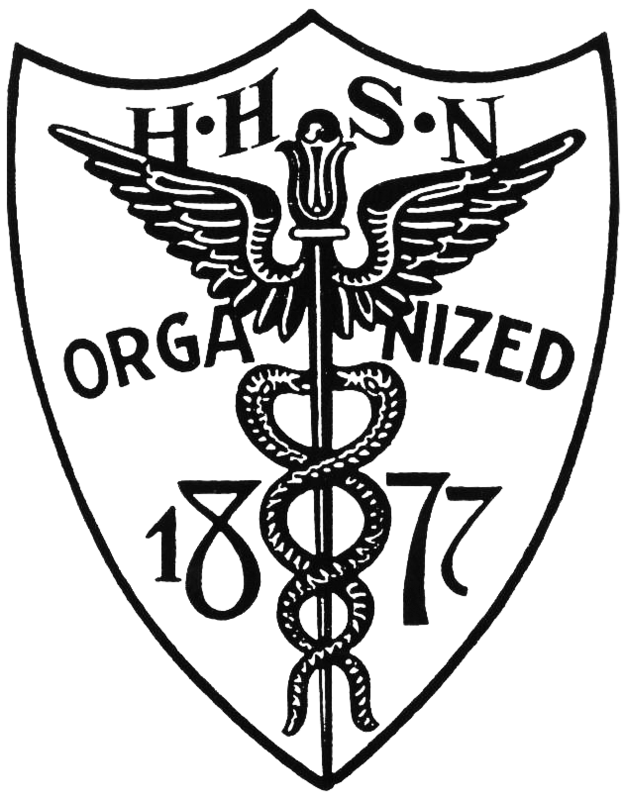 The officers and members of this Association were active workers in the organization of the Graduate Nurses Association and in securing the Connecticut State Law for Registration of Nurses. Mrs. Mary Dennison Fuller '82, a past President of the Alumnae Association was elected first President of the Connecticut Graduate Nurses Association. Miss Charlotte M. Brown, Superintendent of the Training School and an honorary member of the Alumnae Association was a member of the first Board of Nurse Examiners, appointed by the Governor. We regret that space does not permit us to give a more detailed account of the work accomplished by the officers and members of the HHTS Alumnae Association. Among the past presidents of the Association, we find the name of Edna L. Foley '04. Miss Foley, who was active in the organization of the National Organization of Public Health Nursing, was elected it's first Vice President and later President. Also, Miss Ida F. Butler '01, was elected for two years as President of the Alumnae Association and now Assistant to the National Director of Red Cross Nursing. Many other members are holding important positions in the nursing activities of today, and we claim some credit for the success in the work they have accomplished. During the 12 years of Miss Sutherland's work as the Principal of the Training School, she was well known to all the members of the Alumnae Association as a wise executive, an able teacher, a gracious hostess, and a loyal friend. At the September meeting in 1918, a few months after her sudden death, the Alumnae Association voted to establish the Lauder Sutherland Memorial Loan Fund to assist nurses desiring to study for special work. It is a fitting memorial to Miss Sutherland, whose greatest ambition was the advancement of the nursing profession. While this is a history of the Alumnae Association of the past, we cannot close without a word of appreciation for the kindly interest shown us by the present Principal of the Training School, Miss Robina Stewart. She has shown a deep interest in the Alumnae Association. It has been largely due to her efforts that all present graduates have become members. Beginning with the class of 1920, each graduating class has contributed $100.00 to the Lauder Sutherland Memorial Loan Fund. Since the affiliation of the State and National Societies, the work o the officers and responsibility of the Alumnae has greatly increased. In looking over the records for the year 1900, we find Mrs. Tuttle, who was present at the meeting when our admission to the Associate Alumnae was announced, saying, "Remember you must share the responsibilities as well as enjoy the privileges of this new organization. (Now the ANA.) We pass this on to the members of the present day and wish them all success in sustaining what we planted in 1892." 11/1913 -- Motion to exempt any graduate over 30 years of membership from paying dues (recinded several years later). 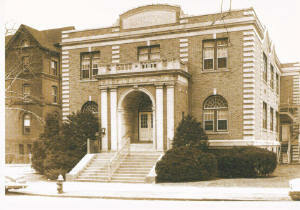 9/1921 -- Lauder Sutherland Fund made wholly a Loan Fund for nurses wishing to become teachers or hospital instructors. 11/1921 -- A committee was appointed to prepare an annual bulletin for the Association. 9/1922 -- Meeting of the Lauder Sutherland Fund was held. Dr. Ingalls suggested the following: "The amount of the fund should not be sufficient to finance any whole course as it might make the applicant less independent." The question of the surety for the note was discussed but it was decided that an unendorsed note would be sufficient. The following motion was made by Dr. Ingalls and unanimously carried. "1. The amount of the loan is not to exceed $500.00 for not longer than three years at one per-cent interest. 2. The fund is available to any HHTS alumna for post-graduate work, the character of which must be stated on the application. 3. The Hartford Connecticut Trust Company is to be Treasurer of the Loan fund. 4. Application must be made to the Chairman of the Loan Fund Committee and receive unanimous vote of said committee." 11/1922 -- Mrs. House '99, our oldest graduate, spoke at the meeting and presented a beautiful vase to be kept as an heirloom by the Association. This was Mrs. House's 80th birthday. 6/1924 -- A reception was held for Rachel McConnell, the new Director of HHTS. 1927 -- School paper named "Scalpal"; Class of '27 latest in Connecticut on State Boards. 50th Anniversary of the founding of HHTS was celebrated with 49 classes present. 11/1929 -- Bertha Graves '03 leaves $1,000.00 to the Association to be used for the sick and needy members. This was the start of the Bertha Graves Memorial Fund (which has become the Loan and Emergency Fund). The Barney Building opened in 1932. It was part of the School of Nursing and featured a gymnasium, a swimming pool, classrooms and a library. 1931 -- Graduate Nurses Association meeting in New Haven. We sent one delegate to each of the sections: Education, Public Health, Private Duty, and we also send one delegate to the ANA Convention in an Antonio. And in 1931, we received an official offer from the Executive Board of HH to accept our money ($30,000.00) for a Free Bed Fund. It covered day rate and 50% of extras (i.e. OR, X=ray). 12/1934 -- Miss McConnell read an extract from the Winchell Smith Will which is to defray the expenses of the nurses of HH staff and graduates of the school. 1935 -- House Bill 856 introduced to the legislature re: registration of nurses. 1936 -- Associate members of the AA told they will not be allowed to work at HH unless they are members of the AA per Louis Sexton MD, Director of HH. 10/1937 -- Jean Wheeler offered a list of names of nurses who served in WWI. Millicent Lister was one of them. She graduated in 1917 and was killed in the war. We planted a Memorial tree for her in Newington. 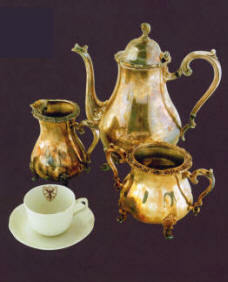 This silver tea set owned by the Hartford Hospital School of Nursing saw daily service in the 1940s, 1950s & 1960s. Private Duty staff set up as a Registry with list of rules and call list. 3/14/1940 -- Speaker was Professor Andre Schenker from UConn who spoke on view and news of the European situation (even touched the AA). -- Alumnae Bed Rules amended to delete payment for OB and related cases, and minor surgery (i.e. T&A's; dental). 1941 -- Late Dr. Phineas Ingalls left $1,000.00 to our Alumnae Bed Fund; Miss Rachel McConnell retired. 1942 -- From the Annual Report "the greatest achievement of the year was the awarding of a o$500 scholarship to a member of the Association chosen by the Scholarship Committee. This is the beginning of what we hope will be a yearly achievement. We had two Rolls of Honor, one in the Residence and one in the Hosital. WWII Alumnae members will be carried by the Alumnae until the end of their service. Miss Ethel Brooks because our new Director of Nursing Service and School of Nursing. 1944 -- Political Action: We sent letters to Senators and Representatives in favor of Army Rank Bill which will give nurses pay and privileges of the similar Army rank. 1945 -- Rose Kreuter Knoek '21 gave the AA a $100 bond to be used in helping sick nurses. 1946 -- We had been left the house and property of Miss Lucy Pratt Mitchell '13. A committee was formed after we acquired title to her property to oversee expenses and care of the Mitchell House. Two trees were planted on Memorial Day exercises in memory of two WWI veteran graduates, Alice Blake and Grace Pollard (no mention of where they were planted). 12/1946 -- A letter was received from the Executive Committee of HH notifying us of the appointment of Mrs. Gilbert Ashley as Alumnae representative to the HHSN Committee. Following considerable discussion regarding whether her activities in the Alumnae qualified her to act for the Alumnae Association, a letter was sent to the Executive Committee concerning her appointment. (Even then we were advocating for our association). 1947 -- Quadrennial meeting of the ICN (International Council of Nurses) was held in Atlantic City and two members were sent. Also the ANA Convention was held in Chicago and two members went. Two members were sent to the Connecticut Sate Nurses Convention and to the New England Division of ANA in Portsmouth, NH. 1948 -- Miss Carol Turner '34 was working in Africa with the Faith Society of Calvery Temple, Hartford. We sent money to them for the purchase of hospital and surgical supplies to be used for their mission work. In March, HH had an open house for the new hospital with the Alumnae acting as hostesses. We also assisted in moving patients to the new hospital. 5/1948 -- The World Premier of "the Fuller Brush Man" was held at the Bushnell and two nurses from HH, St. Francis and Mr. Sinai having the longest services were given free tickets. Our two nurses were Helen Jones (Superintendent of the Old Peoples Home for 35 years -- now Jefferson House) and Eva Crowdis (Superintendent of the Nurses Residence of 33 years). Proceeds from the premier were divided between the three hospitals. 6/1948 -- A special meeting was called to discuss the Lucy Mitchell Recreation House. Question was whether to keep it or sell it and how to keep it open and available to nurses at all times (for recuperation or vacation) Suggestions were as follows: (1) Publicize it as to where it is (North Granby) and what it is to be used for. (2) Let the public give contributions to the house. (3) Establish a fund to support and finance maintenance. (4) Charge someone in the house to keep it open (unlocked), and have a nine member committee will continue to oversee the house. 10/1948 -- It was decided to award a $50 prize to be given annually in memory of Linda Richards to the most outstanding bedside nurse in the graduating class. 12/1948 -- A Golden Jubilee Dinner for Linda Richards was held in NYC. We sent Isobel Shannon, Mary C. Johnson, and Caroline Kouffman, all of whom were students of Miss Richards when she was Supervisor of Nurses at HH from 1895 to 1897. 1949 -- A decision was made regarding Lucy Pratt Mitchell Recreation House. It will be open June 1 to October 1, having a paid caretaker with a car. We will try this for a year then assess safety (for example no telephone, fire protection, bus service or caretaker) and start a fundraising campaign for monies to correct problems. 10/1949 -- Free membership for 30 year members started. 1950 -- President and second delegate sent to the ANA Convention in San Francisco. 12/1951 -- It was decided to sell the Lucy P. Mitchell House. Mr. McCook, our lawyer, explained that according to Lucy's Will, 3/4's of the total goes to the Loan and Emergency Fund and 1/4 to the Alumnae Bed Fund. The new AA office in the Medical Building ready for occupancy. HHSN Was ranked in #1 group by State Board. 4/1951 -- A buyer was found for the L.P. Mitchell House. Miss Brooks agreed with AA that HHSN graduates wear blue ribbons on their caps and Head Nurses an Superintendents wear black ribbons. 6/1951 -- It was voted to combine Bertha Graves Fund with the Loan Emergency and Mitchell House Funds to be known as Graves-Mitchell Loan and Emergency Fund. Miss Brooks announced that the Diamond Jubilee of HHSN would be celebrated May 12, 1952. Alumnae members to be on the committee. She also discussed the Nursing Shortage (some things never change). The Hospital asked us to staff one unit (North 12) with part time nurses 24 hours per day, 7 days a week. It was decided that each class to fill in as above with an appointed captain to arrange coverage. It was also decided to appoint a committee to set up a budget (we id not have one until now). Also voted to purchase a grand piano to be presented to the school for the Diamond Jubilee. Voted Honorary membership to: Mr. John O. Enders, Chairman Board of Directors of HH; Mr. William Putman, President of HH; and Dr. Wilbur Allen, Director of HH. Also Mr. Barclay Robinson, Executive Committee; Professor J. Wendall Burger, Chairman of the SON Committee; Mr. Anson McCook, our lawyer; Mr. Edward N. Allen, Lt. Governor; Mrs. Beatrice Fox Auerbach, owner of G. Fox; and Mrs. Paul Butterworth, SON Committee. 11/1951 -- Watkins Piano Company chosen for us to buy Steinway. 4/1952 -- Contributed $25 for Memorial tree for Margaret Hyde '125, who died July 1951, to be planted on Memorial Walk at Newington Veterans Hospital by Jean Cargill, American Legion Nurses Post #129. 5/1952 -- Dr. Ingalls gave us $1,000 to go to Alumnae Bed Fund. HHSN Diamond Jubilee held at the Bushnell Memorial with a tea for the Alumnae. During the 50's, several donations were made to the Bed Fund: $1,000 in 1954, $7,000 in 1958, and several other smaller donations/gifts from graduates and friends of HH. 1953 -- We gave $20,000 to HH for Bed Fund. Banquet was held on September 9th at the Hartford Club at $3.50 per person. 1954 -- New Haven graduate expressed a wish for a Chapter. 1/1956 -- Question regarding changing school uniform was discussed. To be investigated. 4/1956 -- Banquet at Statler Hotel. Sketches of new uniform designs to be shown. 10/1956 -- New uniform voted on. 3/1957 -- Voted to donate $2,000 to the Fund for the new student residence. 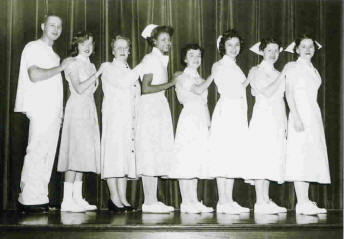 5/1957 -- Suggested by the Alumnae Association to HH that nurses with physical handicaps be hired. Met with Miss Brooks and Dr. Hamilton. 9/1957 -- Balloting by mail started. A decision was made to appoint the Executive Secretary (as opposed to electing her). The first appointed Executive Secretary was Grace Wenzel Holland '24. 1958 -- The price of joining the Alumnae Bed Fund was raised to $50.00. It was also voted to have an Alumnae chair with the School of Nursing insignia on it. Talks continued with the New Haven members regarding their request to become a chapter. 1959 -- New Haven Chapter became active. 1960 -- $10,000 of Alumnae funds were transferred to the Alumnae Bed Fund at HH. HH plans for expansion started. Dr. Hamilton talked to us about the plans. 1961 -- New Haven Chapter president, Georgia Clark Erickson '53 met with the Alumnae to discuss the Chapter and it's plans to donate to the October Fair. It was decided to send a member of the Alumnae to the Chapter meetings and visa versa. 1962 -- Miss Brooks presented the HH Disaster Plan made up after the December 8, 1961 fire. The Alumnae will participate in it. 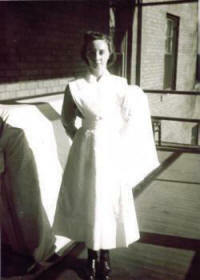 Rose Knoek '2`1 left us a bequest of the income from $57,000 to be used for sick and needy nurses. 1963 -- Discussion on discontinuing "30-year membership" as it has become a financial drain. Miss Brooks presented tentative plans for new residence. A change in the cap was discussed and decided on. First mention of giving 25 and 50 year membership pins. Discussion regarding Rose Knoek Fund: We wanted to open it to other uses. Judge Kinsella's decision was that it must be used ONLY for sick and needy. We also discussed our donation to the HH Building Fund. 1964 -- Our Bed Fund: Dr. Hamilton Requested that the surplus monies be kept by HH to be used against future deficits. The Fund was opened July through September for those who wished to enter it. Knoek Fun: The Attorney General reversed Judge Kinsella's decision, stating "the money must be a fund in trust." The Law Firm of Shatz and Shatz were appointed Trustees. The Loan and Emergency Fund was renamed the Lucy Pratt Mitchell Fund. Outright gifts would be limited to $200 and loans to $500. The 25 and 50 year pin design was approved. Violet Cowles was appointed as Executive Secretary after Grace Holland resigned. Miss Helen Farrell was appointed Executive Chairman of the Building Fund for Nurses Residence. Violet Cowles resigned as Executive Secretary and Dorothy Peasco was appointed to the position. A bequest by Sarah Ripley of $25,000 was added to the Alumnae Bed Fund. 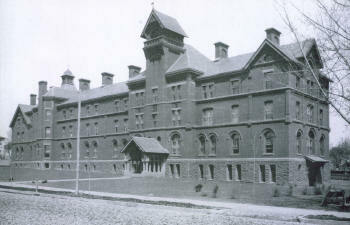 The Old People's Home (built 1884), circa 1890 on Hudson Street, was razed in 1965 to make way for the Hartford Hospital School of Nursing complex. 1965 -- Our new caps are ready. They are permastarch and resemble our caps. They will be on display at the June Banquet. 1966 -- We presented the piano to the school as a memorial gift for Grace Holland. In October, we were invited to the cornerstone laying of the new Nurses Residence. 1967 -- There was a discussion of starting a newsletter. A committee was formed to investigate the idea. The class of '59 initiated the Dr. John C. Leonard Award of $50 yearly to a Senior Student Nurse. 1968 -- We decided to use money left by various class treasuries to purchase silver to complete the silver services in the Nurses Residence. The following pieces were purchased; One silver-plated Revere Punch Bowl (15 qts. ), one silver round tray and one silver round ladle. In memory of Dorothy Cornwall Martin: one silver-plated coffee pot (Jo-Ann pattern), one silver tea pot, and one sugar bowl and creamer. Also one candy compote. In memory of Arthur Haugh, we also bought two silver-plated five inch Revere bowls plus two crystal clear inserts for the bowls. This left a balance of $92.70 in this fund. There was a discussion about what to do about the Swan and fountain in Heublein garden. It was decided to keep them in that garden and not move them to new Nurses Residence. Miss Heken Roser retired. We gave her a HHSN chair. It was also decided to carry those Alumnae members serving in Vista or the Peace Corps. The Scholarship Fund name was changed to Dorothy Palmeter Howard Fund due to a large bequest from her estate. Our newsletter, The Pillbox, was a big hit. The chairman of that committee will be added to our list of Alumnae officers. The New Haven Chapter presented a portrait of Miss Rachel McConnell to the school at our Annual Banquet. 1969 -- The January meeting was well attended with 40 members with a pot luck supper prior to the meetnig. Miss Brooks' retirement was announced effective August 31st. We decided to rent the "Dolly Madison" for a farewell cruise/party up the Connecticut River and give her a 25-year pin. We also named a student award in her name. The Award (as worded by Miss Brooks) was "presented to the member of the graduating class whose kind,skillful nursing care has been characterized by a spirit of living and giving with joy" (5/25/69). 1970 -- Our first male graduated. Meetings were decreased to two per year, to be held in April and October. The Bulletin is to be published every five years. Barbara Donaho, the new Director of the Department of Nursing was introduced to the Alumnae meeting. 1971 -- The question of what would happen to the Alumnae Bed Fund in control fo HH in the event ot eh US government should take over HH was discussed. A motion was made to have our lawyer, Donald Richter, to investigate this. A special meeting was held in July to discuss results of the discussion between AA Treasurer ad IRS agent regarding our status as a non-profit organization. Decision was made to hire a tax attorney to investigate our position. AAHHSN placed o mailing list to receive the publication of Congressional business through the office of Senator Abraham Ribicoff. 1972 to 1985 -- Minutes are missing. Some of the following years were taken from the Bulletin. 1976 -- The year of our last graduating class. Pat Rielly, President of the Alumnae Association, in her greeting in the '76 Bulletin aid, "We are fortunate to hae been members of a fine school. We can keep alive the standards established by HHSN." 1977 -- A Centennial celebration of HHSN was held in September. The following is an article that appears in the Rxtra: "The Hartford Hilton Ballroom was the scene of our celebration. 510 Alumnae of HHSN gathered to join with the Board of Directors to note the 100th anniversary of our school. The traditional Annual Banquet was replaced by this Centennial Celebration. Honored guests were Miss Ethel Brooks, former Director of the School; Dr. T. S. Hamilton, former Executive Director of HH and Mrs. Hamilton; Dr. J. Wendell Burger, former member of the SON Admission Committee and Mrs. Burger; Miss Helen Roser, former Associate Director of the School; Mrs. Paul Butterworth, former member of the SON Admissions Committee; Father Thomas Gaffney, former Chaplin at HH; and Mr. John Springer, Executive Director of HH and Mrs. Springer. Highlight of the evening was a skit developed by Pat Audet and Marilyn Folcik. With the help of several other Alumnae, they offered a delightful "conversation" between Florence Nightingale and Clara Barton. The history of Nursing and nursing at HH were covered. Many old songs important to all of use were sung. Each era of the SON was represented. When the roll call was sung, we were pleased to note that the 50th Anniversary Class had 30 members in attendance. The Gold Star went to the representative from the Class of 1913. All in all, it was a memorable evening. Also, this year, Miss B rooks' first volume of "A Long Way", a history of HHSN was published, followed later by Volume II. 1986 -- A decision on HHSN shield pins was made. Resale was restricted to Alumnae members. Marion C. McCorkell '17 left us stocks worth $70,000 in her Will (a living trust) which became the McCorkell Fund, a non-restricted fund. Dissolution procedure needs to be considered. Bylaws need updating (see 2001 for resolution). 1987 -- The third volume of History of HHSN is in print and was available at the Banquet. This was compiled by Barbara Doyle '50. 1989 -- The Alumnae Office was moved to Ingalls II. 1990 -- Elizabeth W. Knight, Assistant Treasurer meets with our lawyer regarding clause concerning dissolution. 1992 -- Talks with HH CEO John Meehan and HH Treasurer John Biancomono were held to discuss opening the Bed Fund to other uses at HH. Examples were Pre-admission testing, use of Jefferson House, Medical Lab, etc. Alumnae meetings changed to two annually, the Banquet and the Annual Meeting in the Fall. Valle's Steak House closed, so the Colony Restaurant will be used for the Banquet. 1993 -- Louise Beecher Seeley '40 donated $1,000 to Lauder Sutherland Fund. The 4th and final Edition of the History of HHSN was published, compiled by Pat Audet '56. 1994 -- Marilyn McKeown '69 presented an idea to make a gift to HH that would forever remind all who come to HH that there was a School of Nursing at HH that should not be forgotten. 1995 -- A resolution was passed to combine all funds under Assistant Treasurer into one called Alumnae Fund. Bronze statue, donated by alumni to commemorate the school, stands in the hospital's Meditation Garden. 1996 -- Executive Board of AAHHSN voted to support the concept of a study regarding a memorial statue of HHSN. A memorial committee was formed in August with Karen Mazzarela '69 and Mary Jane Densmore '69 as co-chairmen. Other members were Mailyn McKeown '69, Coordinator and Founder, AAHHSN Board members Pat Audet '56, Elizabeth Night '56, President Joan Haines '61, plus Pat Ciarcia '62 Secretary, Jane Lasher '74 Treasurer, Terry Gwozds '76, Mary Manion '57 and Eppie Ferree '41. 1997 -- A formal arrangement between the Memorial Project Committee and the Alumnae Association was set up as the Committee needed to use the Alumnae's tax number. Fundraising began. A Corporate Resolution was drawn up by our Lawyer. 1999 -- Dissolution of the Memorial Project was prepared. All materials reverted to the Alumnae Association. A search for a sculptor followed. Dr. Lloyd Glasson was chosen. The Tallix Foundry in NY poured the statue. John Zito Co. of Hartford poured the foundation in the Meditation Garden at HH. Finally, on April 16, 2000, with all the meetings and worries over, we had the dedication on a beautiful day with over 500 HHSN graduates and their families present. Many friends and colleagues also attended. A formal tea was given by HH in the Education Hall's meeting room. 2001 -- At the Annual meeting, dissolution instructions for our Association were presented and reviewed. They were accepted for future use to be re viewed p.r.n. 2002 -- History of HHSN Alumnae Association was written and published by Pat Audet '56. 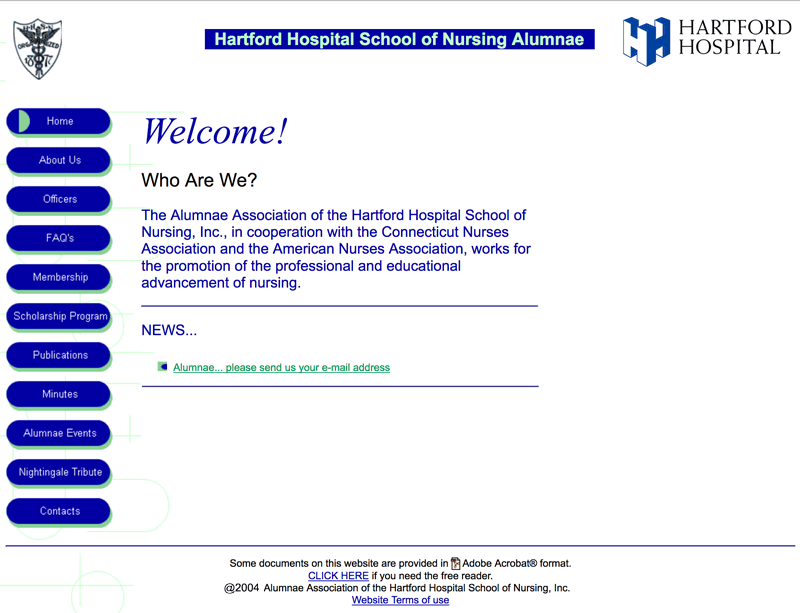 2004 -- HHSN Alumnae Association goes "hi-tech" with the launch of its web site, June, 2004 at http://hhsnalumnae.org. 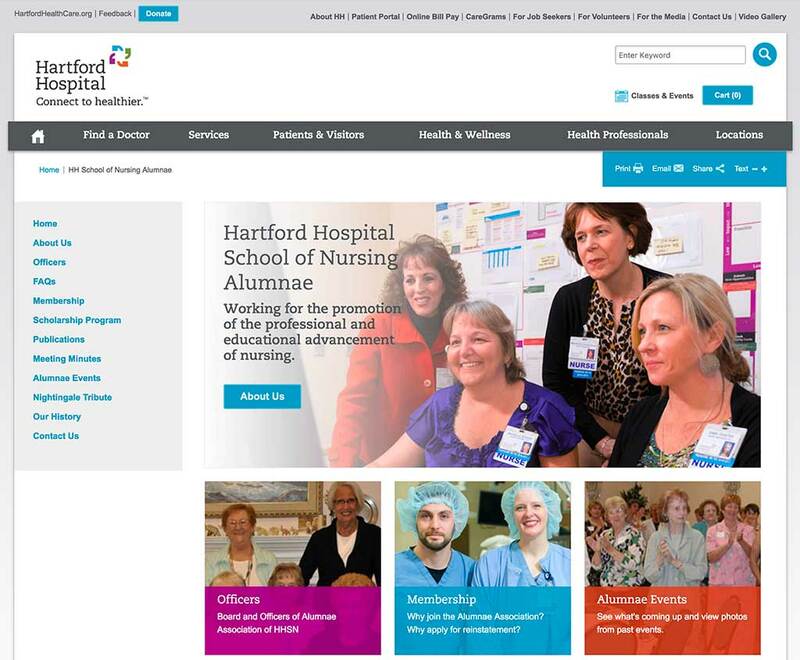 2004 – Hartford Hospital Nursing Magazine began publication bi-annually in the spring and fall. The last 4 pages of the Magazine were dedicated to the Alumnae Association of the Hartford Hospital School of Nursing. Included in these pages is the Pill Box; “A Look Back” section, which honors deceased alum or anything historical related to the past; and the “Alumnae Spotlight”, which features a present day alumna. 2008 – Fireside donations were discontinued. 2008 –Alumnae Association money, previously managed by Hartford Hospital, was transferred to Alumnae Association control and invested into Morgan Stanley Accounts. 2009 – Donations to multiple charities voted by the board to be given annually. 2009 –Scholarship Committee formed to give nursing scholarships annually to alumnae members and their immediate family members. 2011 – The traditional “Bed Fund” was changed to the Medical Fund. Coverage broadened to include any health care facility plus medical equipment, services or supplies including dentures, eyeglasses, hearing aids, etc. 2011 – Membership dues were reduced from $50 to $10 and included membership in the Medical Fund. 50 Year members no longer pay dues. 2011 – The Caregiver Statue was moved from the Memorial Garden to an alcove in the main lobby of Hartford Hospital. 2011 – The Alumnae Association made a $50,000 donation to Hartford Hospital for Nursing Education. 2012 – Title changes approved for the Executive Secretary to Executive Director of Alumnae Affairs, Treasurer to Board Treasurer and Assistant Treasurer to Vice Treasurer. All changes were added to the By-Laws. 2013 – By-Laws were updated and approved. 2014 – Donated $75,000 to The John Kelly Springer Courtyard for a fountain in honor of the nursing education we received at HH. The fountain will replicate "Hepatitis", the fountain in Heublein Garden at the old school of Nursing. 2014 – Donation given to the American Association for the History of Nursing Convention which was held in Hartford. The donation was for tote bags which were given to attendees. 2017 – After 13 years, the Alumnae Association launches an updated web site in August.